A Kurdish proverb states that they have “no friends but the mountains”. Protests across the globe and a whirlwind of social media activity in support of Kobanê indicate that this is not the case, at least amongst people on the street. Those in power who might have been able to prevent the catastrophe at Kobanê appear to be sitting on their hands. If Kobanê falls, as it appears it may, no Kurd will ever count them as a friend. The black flag of ISIS has been sighted in the Syrian city of Kobanê. 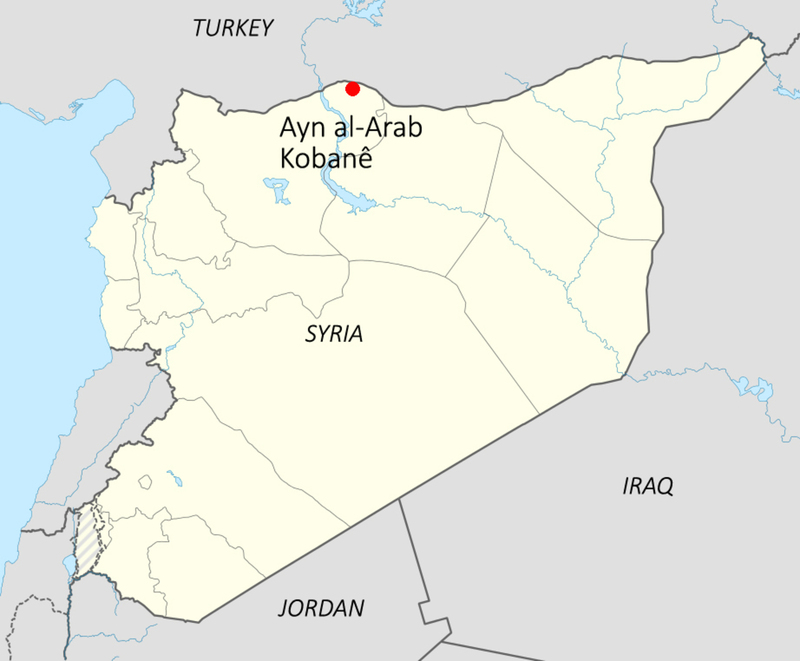 For three weeks, heavily armed ISIS gangs have advanced on Kobanê – also known as Ayn al-Arab – steadily pushing back the local YPG militia. With their backs against the border with Turkey, the militia, mostly comprising local Kurds, but also Syriac Christians, are significantly outgunned. Such are the dire straits that Kobanê finds itself in that almost the entire population has been mobilised. We either die or win. No fighter is leaving. The world is watching, just watching and leaving these monsters to kill everyone, even children … but we will fight to the end with what weapons we have. Social media is peppered with images of AK47-touting grandmothers, of fathers and sons and sometimes grandfathers joining together to man the front lines. The female members of the militia have achieved significant media attention, too, even making the pages of glossy fashion magazines. But for all the tenacity of their fight, local militia have not been able to match the heavy weaponry of ISIS, most of it pilfered when the Iraqi army abandoned Mosul in June. Kobanê officials have now ordered civilians to evacuate the city. Those who go will join more than 160,000 who have already fled across the Turkish border in recent weeks. Many plan to stay, however, to fight to the last. 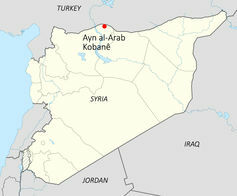 The Kurdish-populated towns of the Syrian-Turkish border area are not attractive. Dust-blown conglomerations of concrete tower blocks, they have little aesthetic appeal, but it can be expected that locals will defend them desperately. Intense clashes are being reported from within the city, with YPG units inflicting heavy losses on ISIS gangs. The episode of Kobanê has unfurled gruesomely slowly. For weeks, Kurdish activists have been calling for support. There have been some US airstrikes against ISIS targets around the city, but locals say they have been few and largely ineffective. In the last few days, as the situation has deteriorated, Salih Muslim, the leader of the Syrian Democratic Unity Party (PYD), visited Turkey to appeal for support. Ankara told him that to attract the support of Turkey he must cast in his lot with the Free Syrian Army. Turkey, which has only recently pledged its support for the coalition against ISIS, appears more intent on toppling Bashar al-Assad in Damascus than on defeating ISIS. Turkey has been assured of NATO support should ISIS make any move to cross into Turkey. Kurds, meanwhile, remain very distrustful of Turkey, whose military is ensconced on the border overlooking Kobanê within full view of the hostilities as they occur. Kurds are also concerned that some grand bargain has been reached in which Kobanê is to be allowed to fall. They are understandably bemused that such a large contingent of ISIS fighters and heavy weaponry gathered in one spot has attracted such paltry and ineffectual international military action. The campaign against Kobanê and nearby Kurdish towns gives the lie to any claim ISIS may have about waging a campaign on behalf of Islam. The Kurds against whom ISIS fighters are committing atrocities are largely Sunni Muslims, fighting alongside local Syriac Christians. That the US-led coalition could not lend sufficient support to these Kurdish forces is likely to result in a humanitarian catastrophe. The coalition has also missed a vital opportunity to demonstrate that its campaign is not anti-Muslim, but is focused on a group that perpetrates outrages even against fellow Muslims. A further irony here is that the brave fight of the PYD has demonstrated the military shortcomings of ISIS. That local militias – with only light arms and little outside support – can hold off a major ISIS offensive, including a great deal of heavy weaponry of US and Russian origin, indicates that ISIS’s military prowess is vastly overstated. The PYD militias are tenacious and are fighting to hold their homeland, to be sure, but one can only wonder how easily ISIS may have been defeated in this arena if the might of the US-led coalition had been effectively brought to bear. Meanwhile, as news of Kobanê’s fate has spread, Kurds around the globe have rallied in massive numbers in support of Kobanê. Protests have sprung up across European capitals, in the US, in Australia and in many Turkish cities including Istanbul. It should be noted that it is not only Kurds who are protesting; concerned observers of all stripes are crying out in support of Kobanê. As it stands, prevarication – or perhaps backroom deals – have meant there has been dangerously inadequate international support for a local, secular, non-sectarian force fighting valiantly to quell ISIS gangs.